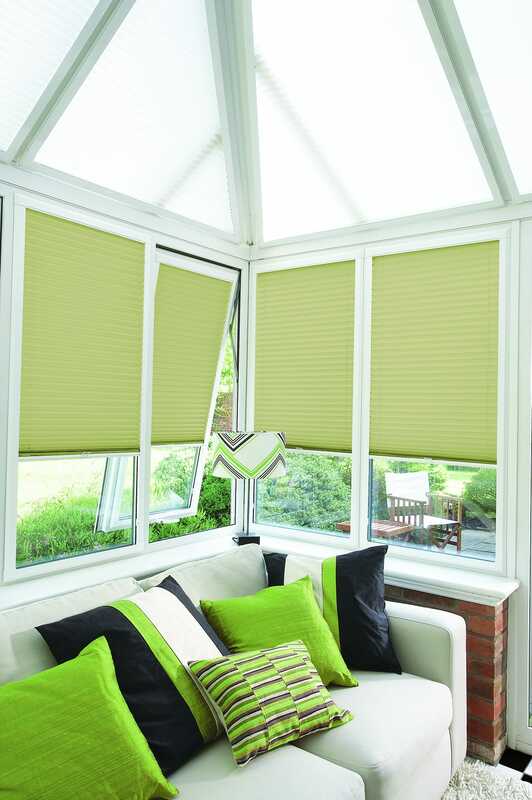 Huge range of conservatory and garden room blinds – we have solutions even for those hard to reach areas. Perfect fit blinds (i.e. the blinds that move with the windows and doors) for an average conservatory cost from £2000.00. 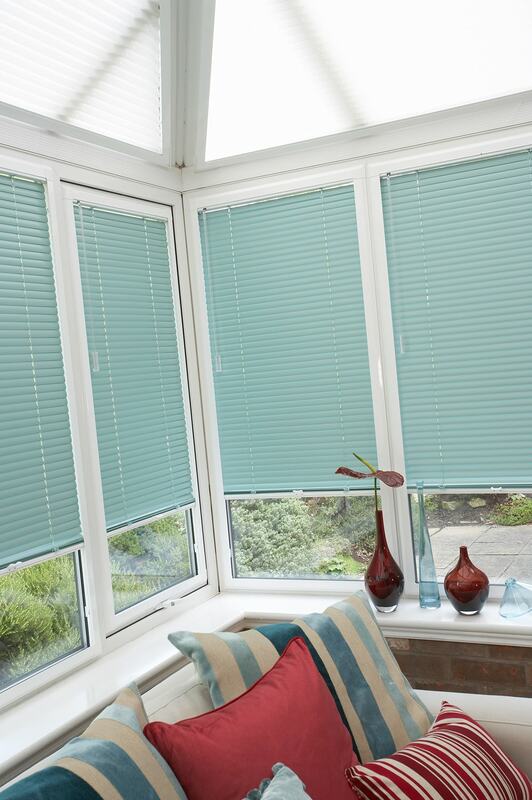 Whether you have a conservatory, garden room or orangery, you can choose from a fantastic range of blinds. 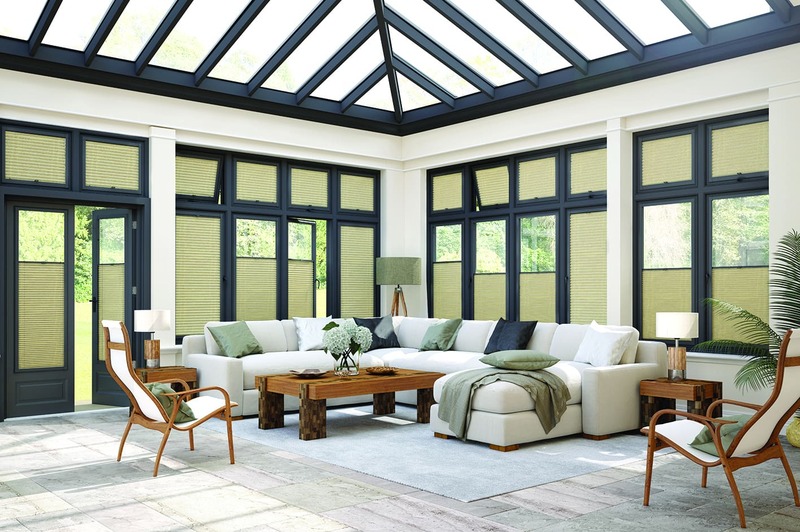 Choose from a range of colours and designs to suit conservatories and rooms of all shapes, sizes and styles, including blinds for the conservatory roof, providing a stylish and practical enhancement to your conservatory and garden room all year round. 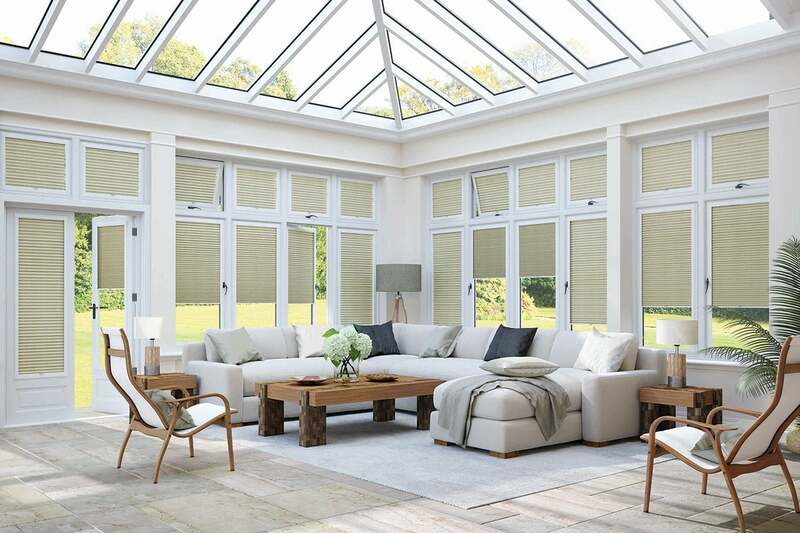 Pleated blinds: Our pleated blinds are the perfect way to enjoy your conservatory in comfort all year round. Pleated blinds work particularly well on conservatory roofs. They draw backwards and forwards along guide wires so there is no sagging. They are available with solar-backed fabric. This makes a massive heat-reduction in the summer, and helps insulate in the winter. You use a wand to open and close the blinds and they stack up neatly on the top so when not in use, they don’t take up a lot of space. 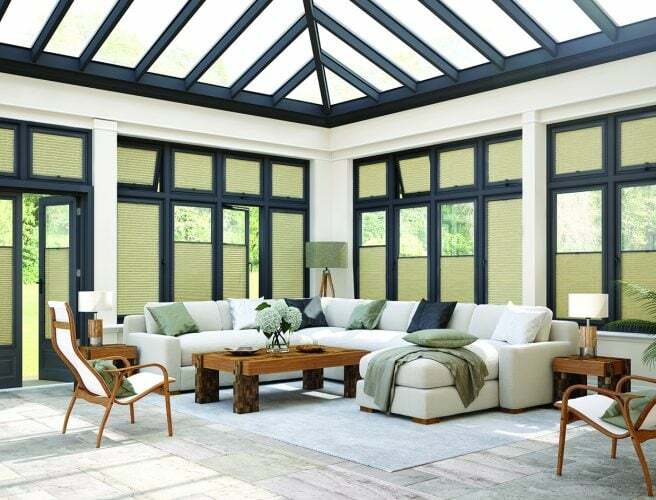 Perfect fit: These perfect fit conservatory blinds were historically used only with PVC windows, but are now available for wooden windows as well. Available in roller, pleated blinds and aluminium venetian styles, they create a neat and tidy solution to the conservatory, especially doors. Perfect fit blinds can be moved down as well as up, and also move with your windows or doors, making them a very practical solution. 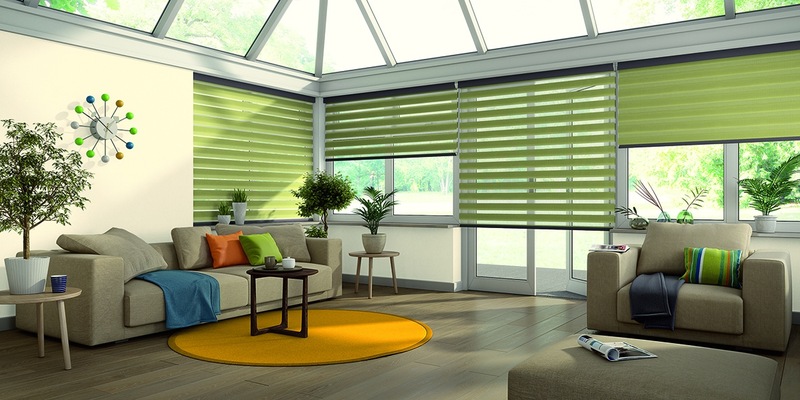 Wooden: For conservatory blinds with a classic look, try wooden blinds. We make our wood venetian blinds in Attleborough to your exact measurements. Roller blinds: Roller blinds are stylish and easy to operate thanks to their simple design. 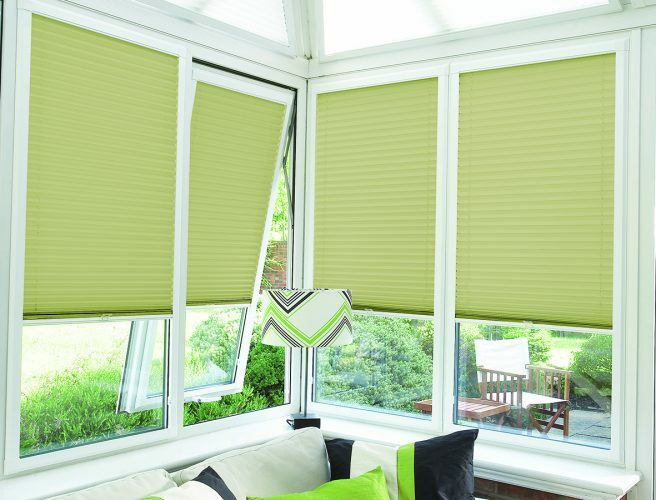 These conservatory blinds can be rolled up or down to adjust the level of shading. 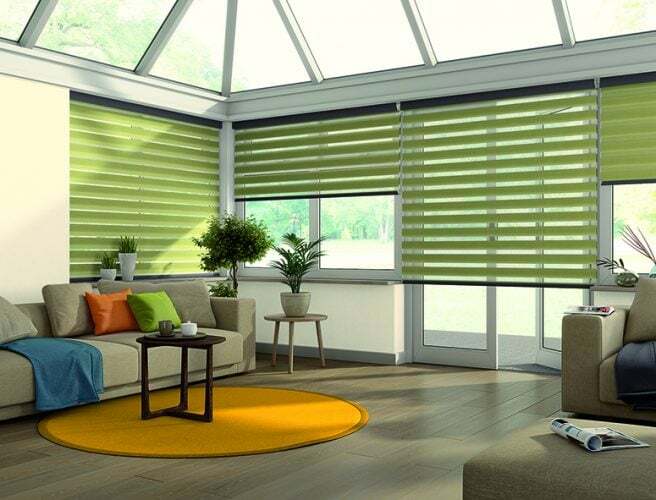 Vertical blinds: Vertical blinds are an ideal practical solution providing both good shade and privacy when needed, and pulled back when not required. Roman folds and curtains: Our roman blinds and curtains both offer a stylish look, best suited to north facing rooms. 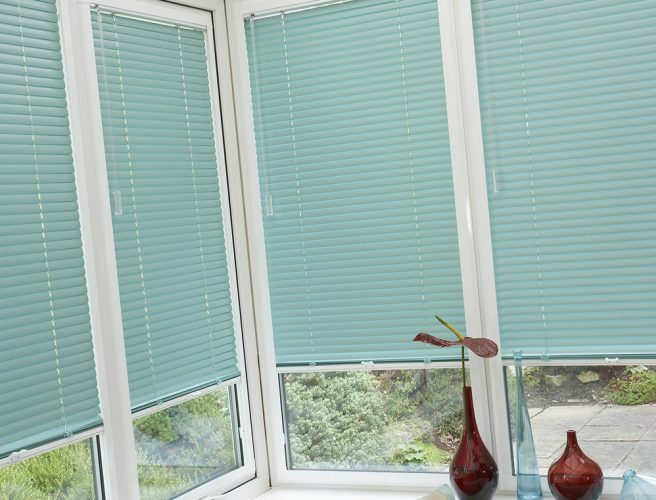 Vision Blinds: these blinds are made from cutting-edge fabric and work really well when motorised. They alternate mesh and fabric which means that you can have them open completely to let the light in, allow the mesh to filter the light, or close completely so that they look like normal blinds. 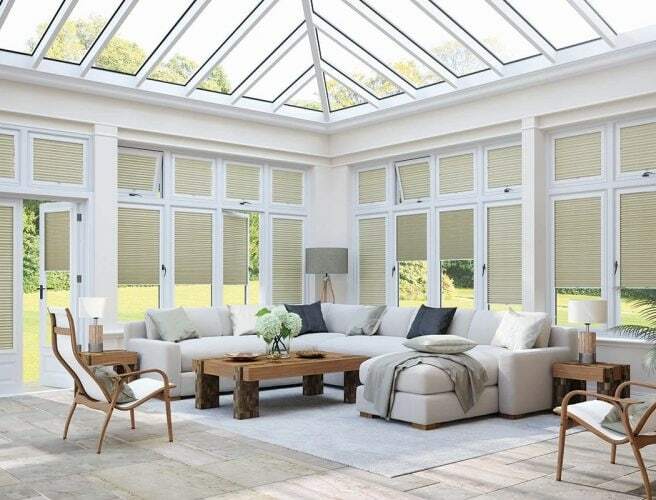 Motorised Blinds: As there are often a number of blinds in a conservatory, including roof blinds, motorised blinds work really well, and save you lots of time. 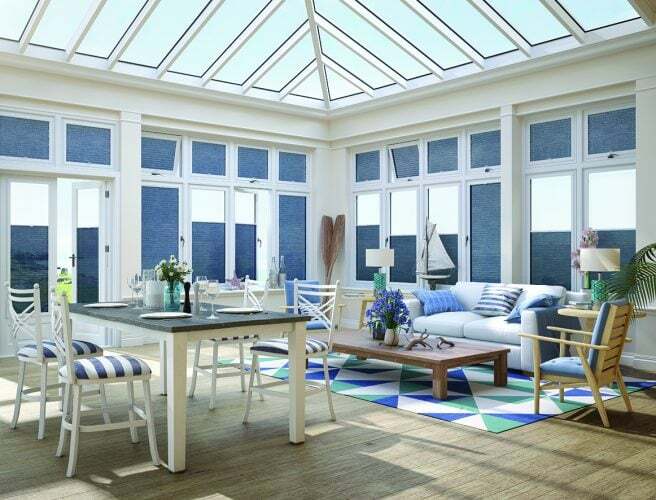 Sails: For something different, have a look at our conservatory Sails – washable, versatile and beautiful to look at, sails offer an unusual way to keep your conservatory cool. 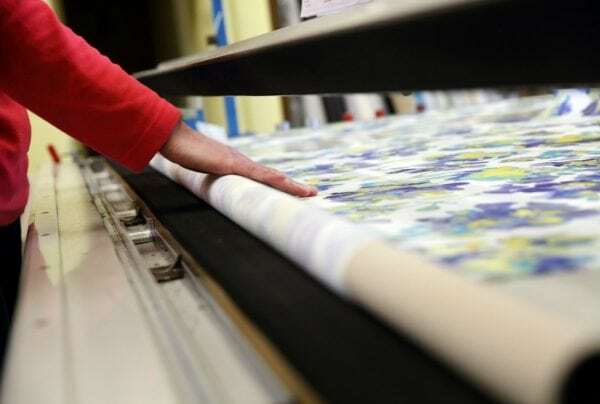 Allusion Blinds: Allusion blinds were introduced by one of our fabric suppliers, Louvolite, in 2019. They are a like vertical blinds but allow you to walk through them, making them an excellent solution for bi-fold patio doors. They can be made from voile-type fabric, giving the lightness of net curtains, but with a much more sophisticated and modern style. All of our conservatory blinds and garden room blinds are made in-house by our team of experts with quality and longevity in mind. This is backed up by a 5-year guarantee. Book your appointment for our free measuring service. To find the ideal set of blinds to go with your conservatory or garden room, why not book a free design consultation with us today? One of our friendly advisors will visit you at a time that suits you, and guide you through the different options. They’ll also provide you with a free measuring service and quote. Once you’ve made your choice there will be no additional costs, thanks to our free fitting service available on all our products. Book a design consultation today. Phone 01603 334085 or visit one of our showrooms. Neat job-pleased with the results. Came on time-minimum of fuss. Friendly and courteous fitters -no pressure salesman. Cleaned up beautifully after job was done. Find out more about vertical blinds for conservatories in our video, starring Fiona, one of our Directors.